Offering unrivalled comfort, usability and style; the SnuzPod 3 Bedside Crib is a must have for any mummy to be! This contemporary bedside cot in a Natural Beechwood Timber look is a stand alone crib and bassinet in one that will have your baby feeling safe and happy in this cosy nursery room essential. Offering a safe alternative to bed sharing or co sleeping, without losing any of the benefits; SnuzPod allows you to easily comfort, settle and feed your baby without having to leave your bed, helping build a close bond and ensure both you and your baby have the very best night’s sleep. It gives you the reassurance and comfort that your baby is snoozing next to you in their own safe sleeping area – as recommended by baby experts. 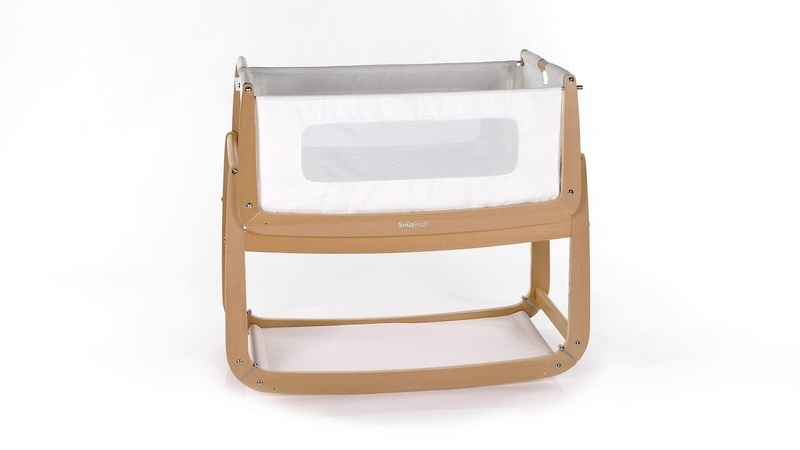 The rocking base helps you soothe baby, while comforters, blankets and essentials can be stored on the lower shelf. After the success of the SnuzPod 2, we bring you some new features! The wide bassinet comes complete with 2 washable mesh fabric sides, promoting airflow and allowing you to watch-over your newborn without waking them. Now with a tilt function, after feeding, this special feature offers added comfort and prevents reflux and with 9 height settings, adjust to suit your needs. Available in a selection of gorgeous new colours, you'll have no trouble pairing with your existing furniture! Much more than just a bedside crib, SnuzPod’s clever and stylish three in one design has been made with you and your baby in mind, a perfect addition to your nursery furniture. So you’re ready to enjoy those precious first months. Snuz Bedding available to buy here at Cuckooland with your Snuzpod! Winner of the prestigious Queen’s Award for innovation! Brand:Snüz. Made in: Redditch, United Kingdom. The much-loved Little Green Sheep family are proudly introducing Snüz, a new brand for you and your baby and the new home of award-winning bedside crib SnüzPod. Their mission is simple. To create innovative quality sleep solutions that are centered around you and your baby, for a great sleep all round! Snüz uses only the safest, highest quality materials for you and your newborn, that way all you have to worry about is spending as much time with your bundle of joy.